Sennheiser has unveiled the successor to their legendary Orpheus headphones. Described as the best headphones in the world, a single pair of Sennheiser Orpheus will cost you over INR 36 lakhs. In 1990 the audio speciality company Sennheiser introduced an audio masterpiece to the world: an innovative set of headphones that replicated the acoustics of a concert hall. The brilliant sound of the engineering masterpiece revolutionised the industry’s ideas about the performance limitations of headphones. The Sennheiser Orpheus had instantly became an icon, and was widely recognised as the best headphones in the world. Now, 25 years later, Sennheiser has introduced a new set of high-end headphones worthy of their predecessor, and a single pair cost approximately €50,000 (INR 36,33,760). The company spent almost a decade continuously pushing the limits of what was technically possible to achieve the precision showcased in the new Sennheiser Orpheus. The new electrostatic headphone system fuses innovative technology with high-quality materials to create a unique sound experience. The headphone’s amplifier system marries the best parts of a tube amplifier and a transistor amplifier. Technically, the product maximizes reproduction precision, spatiality, and frequency response in a way that surpasses the range of human hearing. Sennheiser says it is that technical precision that creates the illusion to the listener of being completely immersed in the sound. The tiniest nuances become perceptible, making every recording seem like a live performance. Sennheiser Orpheus maximizes reproduction precision, spatiality, and frequency response in a way that surpasses the range of human hearing. Even when inactive, the new Sennheiser Orpheus exudes perfection. Over six-thousand components were meticulously selected to create the most outstanding visual and auditory experience. The system has the serene beauty of a work of art. 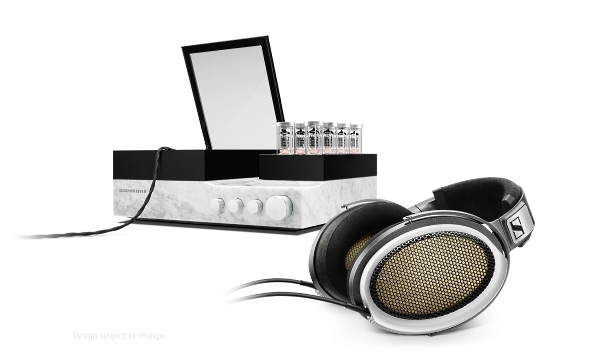 Sennheiser selected Carrara marble for the amplifier casing, the same type of marble used by Michelangelo. The volume control button extends the control elements, each crafted from brass and chrome-plated with chrome, from the marble housing. Quartz glass bulbs holding the vacuum tubes rise from the base and emanate a soft glow. As the glass cover rises, the headphones and their genuine leather ear cups appear as an offering to the listener. Watch the video below to see the Sennheiser Orpheus in action and famous jazz musician Gregory Porter react to these headphones. To further explore the new Sennheiser Orpheus, please click here.